This Travis Rice fellow knows a thing or two about snowboarding. 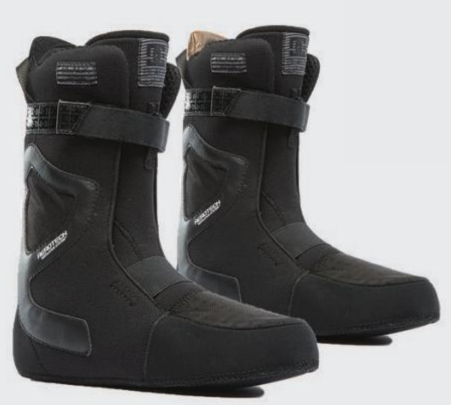 Updated for 2019, the DC Travis Rice Boa Snowboard Boots' exclusive, asymmetrical design is back and streamlined with new material details and refinements. SuperFabric and a zippable Storm Flap help keep powder out of the boot, whether you're legging it to your dream line or surfing the deepness back down. When your snowboarding takes you to places that demand peak performance, put on a pair of DC Travis Rice Boa Snowboard Boots and chase that next adrenaline rush with confidence. Black SE Liner – Pro performance Aerotech Ventilation™ regulates moisture and temperature in the multi-lauer construction of this liner that combine EVA memory foam and a high rebound heat-moldable EVA, delivering an unrivaled custom fit. Lateral support beams and a 360° power strap provide all-season support. Anatomical latex J-bars offer superior heel hold. Boa Focus Closure System with H3 Coiler Reel – The unbeatable H3 coiler platform is fast and easy, offering micro-adjustability for dialing in the perfect balance of flex and support. Sole Re-Purpose Insole – Comprised of 100% recycled EVA and paired with a TPU molded arch support, this insole gives the stability you need while enhancing your balance in the most demanding conditions. Asymmetrical Anti-Drag Outsole – From the visionary mind of Travis Rice comes DC's most advanced outsole featuring a unique asymmetrical design. This outsole is engineered to reduce toe and heel drag - crucial for catch-free descents in steep terrain and reducing the boot's overall footprint. Features a blend of durable rubber and Unilite™.